With some improvement in conversion and transaction rates, Hyderabad seems to be moving out from the shadows of the past now. ‘Almost standstill’ for the last couple of years, the city witnessed completion of some residential projects in Apr‐Jun 2015, improving buyer sentiment. With the city expanding its boundaries due to the presence of huge land banks in the peripheries, the realty ambience of Hyderabad is slowly but steadily improving. After recording a two per cent growth in property prices in Jan-Mar 2015, the city realty saw one per cent growth in Apr-Jun 2015. Though the growth in not exponential in terms of price appreciation, it is an indication of an improving market scenario. Builders in the city are currently focussing on completing their long standing delayed projects, which increased the supply of ready to move properties in Apr-Jun 2015. Very few new launches took place in the said quarter. Greater Hyderabad Municipal Corporation (GHMC) logged a substantial increase in the number of building permissions and approvals taken for residential projects in the last six months. This held true especially for the East and West zone, indicating an improvement in the construction activity. The GHMC also registered an increase in building permission fee by five per cent and property tax collection by close to 10 per cent in the said quarter. Insights from brokers and underwriters indicate an incremental growth in buyer enquiries in first six months of 2015, mostly because of the optimistic sentiments. Select pockets near Hi-Tech City, Uppal, Miyapur and LB Nagar have seen more site visits and deal closures in the said quarter. Upsurge in demand of office space was seen as a major influencer on the real estate market of the city. 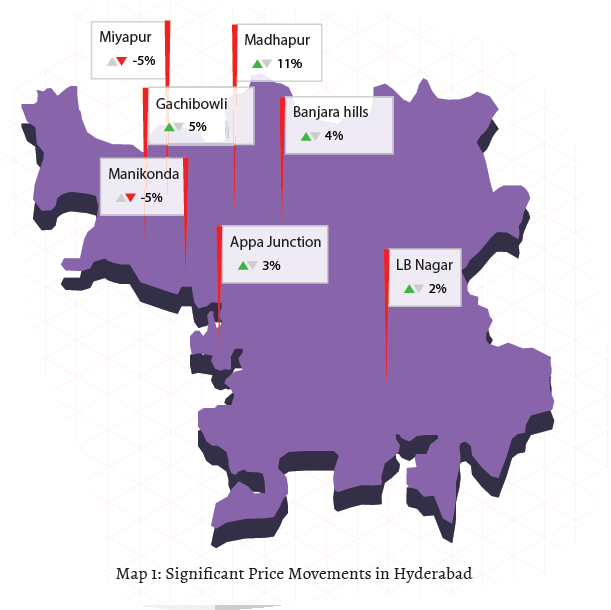 Real estate market of Hyderabad improved in Apr-Jun 2015 with more than half the number of localities registered with 99acres.com witnessing a rise in capital values, varying from one to six per cent. Interestingly, most of these localities are located in Central and West zones of the city. Nallagandla, Lingampally and Bandlaguda witnessed the highest growth to the tune of six per cent in Apr-Jun 2015 as against the quarter ending March 2015. Increasing demand backed by the presence of high supply of affordable properties and proximity to IT hubs such as Hi-tech City, Gachibowli and Miyapur led to rise in capital rates in Nallagandla and Lingampally. Bandlaguda, on the other hand, gained from its strategic location along the Outer Ring Road (ORR), which on one side connects it to the International Airport, and to IT hubs on the other. After dropping by over 10 per per cent in Jan-Mar 2015, the capital values in Appa Junction saw a slight improvement in the Apr-Jun 2015, rising by three per cent. The locality offers ready to move multi-storey apartments priced around Rs 3000 per sq ft.
Madhapur, Attapur, Madinaguda and Ameerpet witnessed an increase of three per cent each in property prices in Apr-Jun 2015. Manikonda, Miyapur and Narsingi witnessed a quarterly drop of five per cent each in capital values. Rental market of Hyderabad has remained stable in the last one year with over 45 per cent of the tracked localities recording negligible changes in rental values. Manikonda witnessed the highest rise of 25 per cent in rental values during the last one year (Apr-Jun 2015 as against Apr-Jun 2014). The locality largely constitutes of multi-storey apartments with rent varying from Rs 8,000 to Rs 15,000 per month. Localities that saw some growth in rental values were either close to office complexes or to educational institutions. Ameerpet and Himayath Nagar recorded eight and nine per cent rise, respectively, in rental values, whereas both Hi-Tech City and Gachibowli saw a seven per cent increase in in the last one year. While Ameerpet and Himayath Nagar gained from the presence of various colleges and educational institutions in the vicinity, rental markets of Hi-Tech City and Gachibowli were influenced by the professionals working in nearby IT companies. Increasing investment by IT/ITeS and e-commerce companies in the city is expected to improve the rental market further. Another major influence will be the commencement of long delayed metro project. Rental values remained unchanged in localities such as Banjara hills, Begumpet, Chandanagar and Jubilee Hills. Supply of various property types in Hyderabad remained almost unchanged in Apr-Jun 2015 as against the previous quarter with residential apartments continuing their dominance in the market. The city witnessed maximum supply of 2BHK and 3BHK units in the current quarter. The supply equation of apartments, builder floor units and independent houses/villas in the city has remained unchanged in the last one year. With over 60 per cent availability, apartments continue to be the most supplied property type in the city in the current quarter. Builders floor units were the least supplied property type with mere eight per cent market share. The category, however, grew by two per cent in the last one year. Similar to that of previous quarter, supply of independent houses/villas captured one third of the market share in Apr-Jun 2015. Promoters in Hyderabad continued to offer properties majorly in the mid-housing segment. Properties worth Rs 25-40 lakh emerged as the most supplied at almost 30 per cent, followed by Rs 40-60 lakh budget category having more than 20 per cent share. The ultra-luxury properties priced from Rs 1- 5 crore were the least supplied in the city, with close to 15 per cent availability. 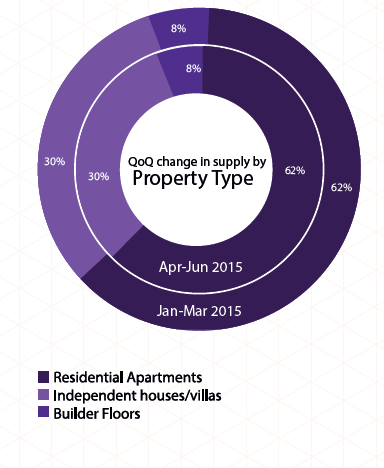 Supply share of such properties has not changed much since January 2015. Supply of inventory in the luxury housing segment (properties priced Rs 60 lakh–Rs 1 crore) remained unchanged in the quarter ending June 2015, and stood at 18 per cent. Affordable housing segment, having properties within Rs 20 lakh, recorded a supply of a little more than 15 per cent in the current quarter. Out of the total builder floor units supplied in Hyderabad, about 68 per cent were available within Rs 40 lakh, while independent houses/villas were mostly available in the price bracket of Rs 1 to 5 crore. About 30 per cent of the total supply of residential apartments in the city was available in the affordable housing category, i.e. priced within Rs 25-40 lakh. 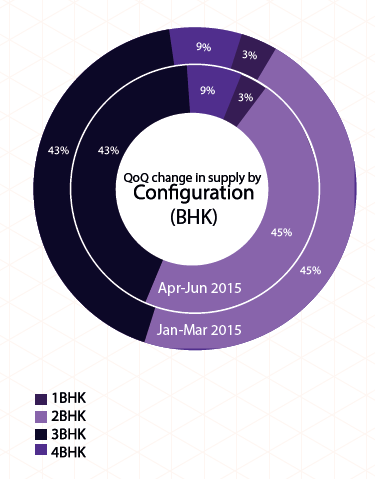 Hyderabad witnessed marginal changes in supply of various configuration types in Apr-Jun 2015, as against the previous quarter. The 2BHK and 3BHK units continued to be the most supplied ones. Over 60 per cent of 2BHK units were ready-to-move-in, in the quarter ending June 2015, while rest of the inventory was under-construction. Overall, residential apartments configured as 2BHK units recorded 45 per cent share in the total supply of various configurations. Residential apartments configured as 3BHK constituted over 40 per cent share in the total supply. Majority of the said units in the city were available in the luxury housing segment (property in the price bracket of Rs 60 lakh-1 crore), followed by properties priced within Rs 40-60 lakh. Most of the 3BHK units were ready-to-move-in. Majority of 4BHK units were available in the independent houses/villas category, while 3BHK units were mostly part of the residential apartment category. Out of the total 1BHK units available, almost 50 per cent were residential apartments, 27 per cent were independent houses/villas, while the remaining were builder floors. Hyderabad had over 60 per cent properties as ready-to-move and the rest were under-construction, as per listings available with 99acres.com. 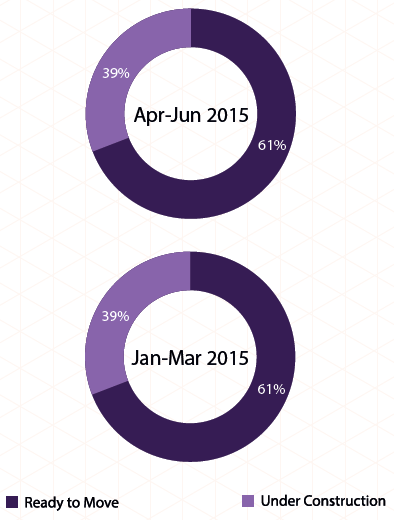 The ratio has remained unchanged in the last one year, indicating fewer new project launches. Most of the under-construction properties (almost one-third) were available in the Rs 25-40 lakh budget category, followed by the Rs 40-60 lakh segment with over one quarter supply share. 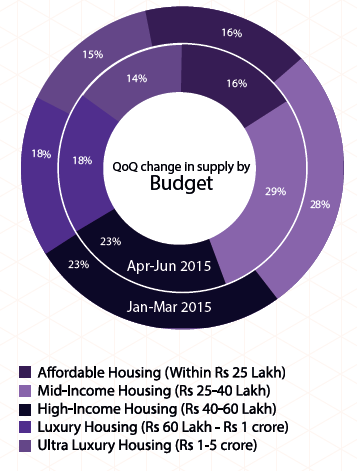 This indicates that Hyderabad is going to cater more to affordable and mid-income housing segment in the time to come. Over 40 per cent of ready-to-move-in properties were available within the budget of Rs 25 lakh in the quarter ending June 2015, while the least were available in the luxury-housing segment (Rs 60 lakh-1 crore). About 44 per cent of the under-construction properties offered 3BHK units, followed by 2BHK units with almost 42 per cent availability. Of the total supply of ready-to-move-in properties, about half constituted 2BHK units, followed by 3BHK units, which formed over one-third of the total share. Though 1BHK units had a limited share in supply, nearly 90 per cent of them were ready to occupy. Low demand for small-sized homes has resulted in limited construction of these units in the city. The trend has been continuing in Hyderabad for several years now. Reports in the past have indicated that Hyderabad will witness an acute shortage of about 3 lakh housing units by 2018. Of this shortage, the Lower Income Group (LIG) housing will constitute over 40 per cent and the Middle Income Group (MIG) almost 35 per cent.